Someone once observed that if Howard Stern and Krista Tippett had a love child, it would be Scott Jones. Scott liked that. 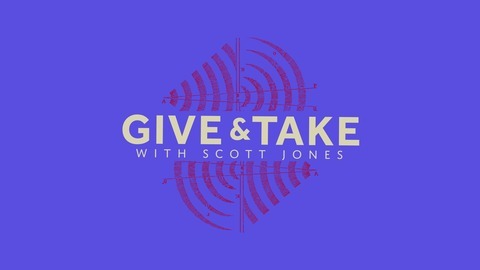 At "Give and Take,” Scott Jones talks with artists, authors, theologians, and political pundits about the lens through which they experience life. 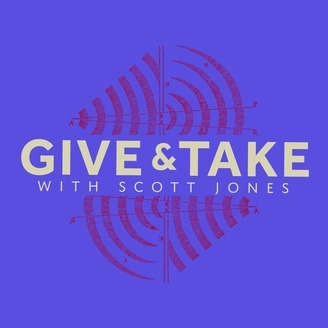 With empathy, humor, and a deep knowledge of religion, current events, and pop culture, Scott engages his guests in a free-flowing conversation that's entertaining, unexpected, occasionally bizarre, and oftentimes enlightening. He likes people, and it shows. Past interviewees include Mark Oppenheimer, Melissa Febos, David French, Miroslav Volf, Dan Savage, Nadia Bolz-Weber, Rob Bell, and (yes) Krista Tippett. Scott is the former host and producer of the popular Mockingcast podcast (https://themockingcast.fireside.fm) and an in-demand consultant on all things “pod.” He’s also the co-host, with Bill Borror, of New Persuasive Words (https://npw.fireside.fm). Scott is also a prolific writer, a frequent conference speaker, a PhD candidate in Theology, and an ordained minister. A New Jersey native, Scott lives with his best friend and wife, Lindy, in the suburbs of Philadelphia with two rescue pit bulls that he swears are sensitive souls. My guest is Jonathan H. Marks. His new book is The Perils of Partnership: Industry Influence, Institutional Integrity, and Public Health. Countless public health agencies are trying to solve our most intractable public health problems -- among them, the obesity and opioid epidemics -- by partnering with corporations responsible for creating or exacerbating those problems. We are told industry must be part of the solution. But is it time to challenge the partnership paradigm and the popular narratives that sustain it? In The Perils of Partnership, Jonathan H. Marks argues that public-private partnerships and multi-stakeholder initiatives create "webs of influence" that undermine the integrity of public health agencies; distort public health research and policy; and reinforce the framing of public health problems and their solutions in ways that are least threatening to the commercial interests of corporate "partners". We should expect multinational corporations to develop strategies of influence -- but public bodies can and should develop counter-strategies to insulate themselves from corporate influence in all its forms. Marks reviews the norms that regulate public-public interactions (separation of powers) and private-private interactions (antitrust and competition law), and argues for an analogous set of norms to govern public-private interactions. He also offers a novel framework to help public bodies identify the systemic ethical implications of their current or proposed relationships with industry actors. Marks makes a compelling case that the default public-private interaction should be at arm's length: separation, not collaboration. He calls for a new paradigm that avoids the perils of corporate influence and more effectively protects and promotes public health. The Perils of Partnership is essential reading for public health officials and policymakers -- but anyone interested in public health will recognize the urgency of this book. Special Guest: Jonathan H. Marks.